When smallpox kills her parents, Camille Durbonne must find a way to provide for her frail, naive sister while managing her volatile brother. Relying on petty magic—la magie ordinaire—Camille painstakingly transforms scraps of metal into money to buy the food and medicine they need. But when the coins won’t hold their shape and her brother disappears with the family’s savings, Camille must pursue a richer, more dangerous mark: the glittering court of Louis XVI and Marie Antoinette. With dark magic forbidden by her mother, Camille transforms herself into the ‘Baroness de la Fontaine’ and is swept up into life at the Palace of Versailles, where aristocrats both fear and hunger for la magie. There, she gambles at cards, desperate to have enough to keep herself and her sister safe. Yet the longer she stays at court, the more difficult it becomes to reconcile her resentment of the nobles with the enchantments of Versailles. And when she returns to Paris, Camille meets a handsome young balloonist—who dares her to hope that love and liberty may both be possible. But la magie has its costs. And when Camille loses control of her secrets, the game she's playing turns deadly. Then revolution erupts, and she must choose—love or loyalty, democracy or aristocracy, freedom or magic—before Paris burns. 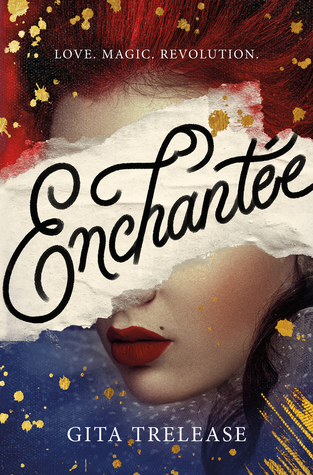 Enchantée by Gita Trelease is a brilliantly captivating new YA historical fantasy novel. Once I got started I didn't want to put it down. The complex world of Revolutionary France that Trelease has created in this novel is atmospheric and thrilling. I practically felt like I was right there in Paris alongside Camille - the city practically becomes its own character. On that note, Camille has easily become one of my favorite new characters. She's willing to do just about anything to protect her younger sister from the crushing poverty all around them and I can totally get behind that. Camille is also quite flawed, but it is remarkable to watch her struggle to deal with the consequences of her magic and ambition. It was also intriguing to track her addiction to magic and how that related to her own identity. As great of a character as Camille is, Lazare is easily my favorite character in the entire novel. He has fantastic chemistry with Camille, and he even has a hot air balloon! As for the magic system, it's quite unique yet simple and I loved seeing the transformations and illusions. It's easy to see how it could all be so addictive. Finally, this easily could have been a five star read for me, but the formatting of the ARC pulled me out of the story. There were several lines on every page where all of the words ran together. Unfortunately that got pretty old quick, but not enough to completely put me off of such a fantastic story. Overall, Enchantée is a great YA debut with a glamorous setting, fascinatingly flawed characters, and a cool magic system. Gita Trelease's writing style is absolutely beautiful and she had me hanging on her every world. I loved how she integrates real life history of the early days of the French Revolution into Camille's story. Plus, I have to admit that I was quite pleased with myself for recognizing all of the French words and phrases peppered throughout the story. If you're a fan of Caraval by Stephanie Garber and Les Misérables, I have a feeling you'll love this new release. I can't wait to read more from Gita Trelease in the future. Merci, NetGalley! C'était merveilleux! I read this ARC from January 20 - 22, 2019 and my review is also on Goodreads. Enchantée by Gita Trelease will be released on February 5th, 2019. I wanted to read this simply off the cover, but now that I know it's good. I want to read it even more. I’m currently reading this arc now! Unfortunately I’m struggling through it. I’m about at the half way mark. Do things pick up? I was so excited to read it but now I’m worried it’s not for me. I’m so so happy you ended up liking it though! I hope you end up enjoying it - it does pick up. Thanks for coming over,Heather. This sounds so good! Too bad about the ARC formatting, though. I've had that happen to me (only much worse) and I had to stop reading. It was awesome! I have as well when it comes to the format. I love a good magic story. ARCs can be difficult but I'm glad you powered through and it came out shining in the end. So am I! It was lovely. Thanks for visiting, Sherry! I loved Lazare. I'm pretty sure this is supposed to be a duology. I was so happy to hear I'll get to read more from them! Thanks! I hope you love it, Mir! I learned (the hard way) that the pub had reuploaded this file since the formatting was a mess. I'm happy you still enjoyed it though! My most recent review is Soul in Darkness by Wendy Higgins. Oh! This sounds interesting!! Great review! Ooooh Caraval is a good comp title I hadn't considered, good call! I agree, the setting and characters and such in this one were amazing! That is sad about the format of the eARC- I had heard it was bad, but then they uploaded a better one, or I would have been in your same boat- it's nuts how it can pull you out of a story! Great review, glad you enjoyed this one too! I wish I had known another was uploaded. Thanks for coming over, Shannon.